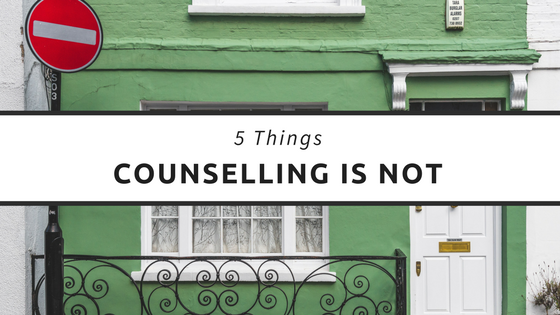 5 Things Counselling is Not! Counseling is not the same as giving advice. Advice is judgmental; it assumes that you need to be told what's right for you. A counselor doesn’t tell you what to do. They will guide you in finding your solution, and not impose their solutions on you. Being told what to do fosters dependence, and counseling aims just the opposite – to empower you to face such challenges in the future. Your counselor may at times suggest possible behaviors or actions, however the decision to implement it would be left to you. Counseling does not give you instant solutions. It gives you an opportunity to gain clearer understanding of yourself and the situation. Often this leads to identification of beliefs or behaviors, which have prevailed for many years, and have been contributing to the problem. Learning new behaviors or modifying longstanding beliefs takes time and effort. You will be setting yourself up for disappointment if you go in expecting a miraculous solution to all your problems. Instead, look at counseling as a place where you will learn the skills needed not only to address the current situation, but also to handle future challenges. Counseling gives you a safe, confidential space where you can be yourself and speak your mind without the fear of being judged. A counselor is not going to judge or criticize you. Instead, they will encourage you to speak freely and extend unconditional acceptance of who you are. Your counselor will give you uninterrupted space to speak, when that is what you need. However, unlike what stereotypes would have you believe, counseling is not an hour of talking to a silent spectator and getting a ‘verdict’ at the end. Most counseling sessions are interactive and collaborative, with the counselor reflecting on and occasionally asking you questions about what you have shared. "Just treat yourself to something nice and get over it!" This is perhaps the most detrimental stereotype about counselling as well as any mental health support! Counseling is not an indulgent pass-time for those with spare time and money. Or, it is only as indulgent as going to a doctor when you are unwell. Or eating food when you are hungry! Looking after your well-being is often overlooked, leading to disastrous consequences – not only for yourself but also for your loved ones.